Windows SharePoint Services allows teams to create Web sites for information sharing and document collaboration, benefits that help increase individual and team productivity. Windows SharePoint Services is a component of the Windows Server 2003 information worker infrastructure and provides team services and sites to Microsoft Office System and other desktop programs. It also serves as a platform for application development. Including such IT resources as portals, team workspaces, e-mail, presence awareness, and Web-based conferencing, Windows SharePoint Services enables users to locate distributed information quickly and efficiently, as well as connect to and work with others more productively. Windows SharePoint Services sites take file storage to a new level, providing communities for team collaboration and making it easy for users to work together on documents, tasks, contacts, events, and other information. In addition, team and site managers can coordinate site content and user activity easily. The Windows SharePoint Services environment is designed for easy and flexible deployment, administration, and application development. SharePoint site members can find and communicate with key contacts and experts, both by e-mail and with instant messaging. Site content can be easily searched, and users can also receive alerts to tell them when existing documents and information have been changed, or when new information or documents have been added. Site content and layout can be personalized on a per-user basis, and Web Parts can be used to present targeted information to specific users on precise topics. Microsoft Office System programs use SharePoint site content. All of a site's collaborative content—for example, documents, lists, events, task assignments, and membership rosters—can be read and edited within Microsoft Office Word 2003, Microsoft Office Excel 2003, and Microsoft Office PowerPoint 2003. Picture editing of Web-based photo libraries is also possible. 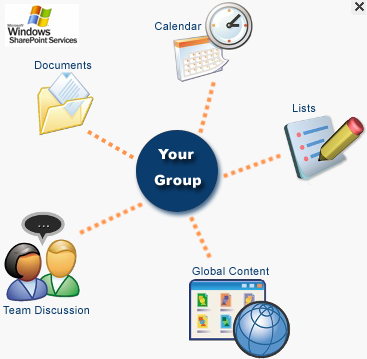 Microsoft Office Outlook 2003 allows SharePoint site event calendars to be viewed side-by-side with personal calendars, and it also creates meeting-specific workspaces to augment group appointments. SharePoint site managers can customize the content and layout of sites to ensure that site members can access and work with important and relevant information. Members' participation can also be monitored and moderated when necessary. Security and task responsibilities are both flexible and easily accessible. Well-designed lists and entire sites can be saved as templates and reused by individuals, teams, or business units across an organization.